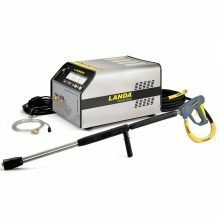 The top-of-the-line stationary cold-water Landa SEA Series features a heavy-duty stainless steel or mild steel cabinet and comes standard with an insulated variable pressure wand, 50′ of hose, and a time delay shutdown. 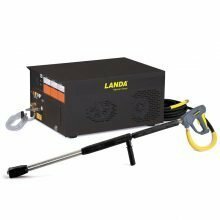 Available options include the Landa LanCom wireless remote control, floor stand, and wall mount bracket assembly. There is even an optional wheel kit for adding mobility, making an already top-quality machine even more flexible than before. 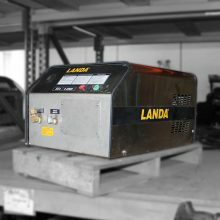 The Landa SEA Series is ideal for cleaning a variety of indoor surfaces, and can be plumbed for plug-and-wash outdoor applications as well. Electric powered, 230v pressure washer. Electric powered, 208v pressure washer. Electric powered, 460v pressure washer. Electric powered, 120v, 1ph pressure washer. Electric powered, 460v pressure washer system. Electric powered, 230v, cold water pressure washer. Electric powered, 208v, 3ph pressure washer. Electric powered, 208v, 1ph pressure washer. Electric powered, 460v, 3ph pressure washer system. 230 volt, 3 phase, 16 amp pressure washer. 230 volt, 1 phase, 28 amp pressure washer. Electric powered, 120 volt, 1 phase, 20 amp pressure washer.